U.S. Immigration and Customs Enforcement officials reportedly detained multiple people in the Bay Area cities of Napa, Pinole and El Sobrante and elsewhere in Northern California on Sunday afternoon, according to witnesses and immigration rights officials. Kris Sanchez reports. 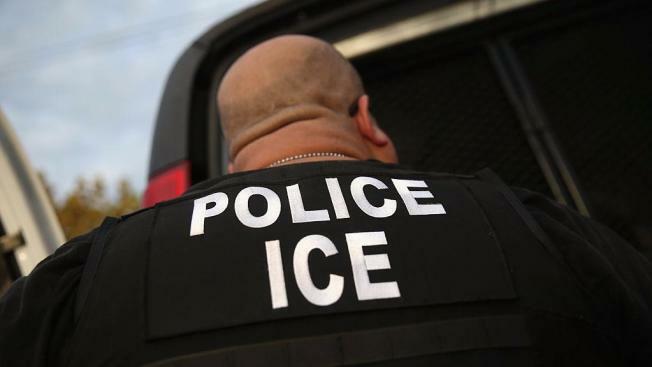 U.S. Immigration and Customs Enforcement officials reportedly detained multiple people in the Bay Area cities of Napa, Pinole and El Sobrante and elsewhere in Northern California on Sunday afternoon, according to witnesses and immigration rights officials. The San Jose-based immigrant rights group Services, Immigrant Rights & Education Network, or SIREN, says a Rapid Response Network reported the detentions, which also were said to take place in Monterey, Sacramento and Merced counties. A SIREN spokesman also said ICE agents could be seen moving around movie theaters and taco trucks in those communities, apparently looking for any additional immigrants. ICE did not disclose how many people were detained. But as many as 11 people were arrested, according to the immigrant's rights group. According to a statement from an ICE spokesman, deportation officers with ICE and Enforcement and Removal Operations "conduct targeted enforcement operations on a daily basis in Northern California and across the nation." "ICE focuses its enforcement resources on individuals who pose a threat to national security, public safety, and border security," the statement from ICE read. "ICE does not conduct sweeps or raids that target aliens indiscriminately. However, ICE no longer exempts classes or categories of removable aliens from potential enforcement. All of those in violation of the immigration laws may be subject to immigration arrest, detention and, if found removable by final order, removal from the United States." Reports of ICE's presence in Bay Area communities came one day after Oakland Mayor Libby Schaaf alerted Bay Area residents of possible ICE operations starting "as soon as within the next 24 hours." In a news release Saturday, Schaaf encouraged all undocumented residents to consult immigration resources after learning from many credible sources that ICE is preparing to conduct an operation in the Bay Area. Schaaf explained she was sharing the information publicly "not to panic residents but to protect them." Although she said ICE has used activity rumors in the past as a fear tactic, Schaaf continued to explain that she felt it was her duty to give families a fair warning of a possible threat. "My priority is for the well-being and safety of all residents — particularly our most vulnerable — and I know that Oakland is safer when we share information, encourage community awareness, and care for our neighbors," Schaaf said in the release. San Jose Mayor Sam Liccardo also issued a statement via Twitter Sunday, writing "we've got your back" while addressing "our immigrant communities." The messages from Schaaf and Liccardo come as ICE agents have stepped up their enforcement this year. Earlier this month, ICE agents went after 77 businesses in Northern California, and in January agents targeted nearly a hundred 7-Eleven stores across the nation, including two in Santa Clara. "While the vast majority of cities in America do cooperate with ICE, others force ICE to assign additional resources to conduct at-large arrests in the community, putting officers, the general public and the aliens at greater risk and increasing the incidence of collateral arrests," according to a statement from ICE. "Sanctuary cities and states are not immune from federal law." Schaaf said she didn't have any information on the specific places where immigration agents were conducting their operations. Immigration attorney Patricia Castorena said anyone targeted by ICE officials should not open the door, remain silent, contact an attorney and avoid signing anything until speaking with an immigration attorney. She also said it's important that parents put in writing who they want to care for their children should they be detained. "The children should go with a family or neighbor, and you need to have a safety plan in effect," Castorena said. Many school districts throughout the Bay Area already have strict protocols in place to protect students and their families, and Oakland police are prohibited from participating in any ICE activities. Residents affected can consult Centro Legal de La Raza for more information on their legal rights to gain a better understanding of the options available in the event that they face detention or need legal representation.